Growth shredded by much more than has been previously mooted but still not enough! Then a magical rebound. Check out the new headline inflation number for June 2019 at 1.25%. They’ve covered over this shocker by elevating core inflation. Then another magical rebound! Someone has finally recognised that the data flow is dire but they’ve not managed to convince everyone. It’s a pulsing monetary maggot only half metamorphosised into a butterfly. Labour market outcomes in the December quarter were better than expected at the time of the November Statement. Near-term leading indicators of labour demand suggest employment growth will remain above growth in the working-age population over the next six months. Further out, employment growth has been revised down marginally, consistent with the downward revision to GDP growth. The participation rate is expected to increase further, encouraged by strong labour market conditions. 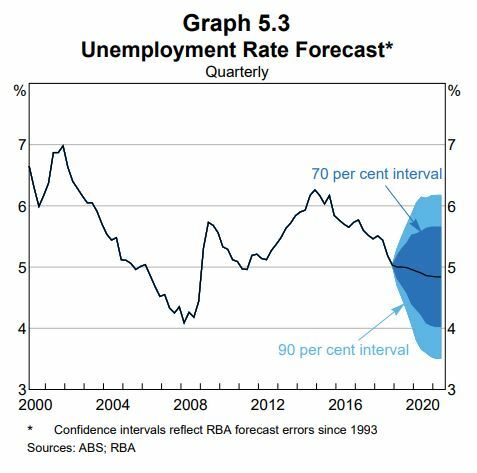 From a lower starting point, the unemployment rate is still expected to decline to around 4¾ per cent by late 2020 (Graph 5.3). Bought GSBE47 minutes before the release having only grabbed a handful of units a couple of weeks ago. Yes, slow learner. But thanks MB – I’ll get there eventually. That’s not a butterfly it’s going to merge from the chrysalis – it’s a killer hornet! The parasite’s parent laid it’s egg in the host some time back…. They add the X when it’s used in an FX pair against another currency. So, silver in FX markets is called XAG. Few people realise that XAU-USD is one of the biggest traded FX pairs. Ah, the infamous ‘hockey stick’ projections — a few sups of the kool-aid and it’s blue skies ahead. 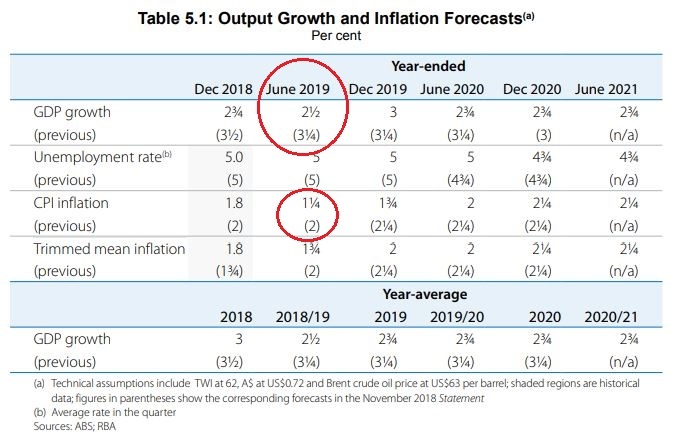 All those well and over paid ppeople who work at the RBA and all they have to do is, once a month match interest rates to inflation and don’t have to worry about any other factor in their determinations. What a doddle! They’ve missed every forecast in the last 10 years to the downside. For them to revise this down to that level, well, it tells me the last quarter was probably negative. But fear not, cut teh rate we shill.